Home Event GenSan Show ABBAmania Live in GenSan! General Santos City - We truly have missed ABBA for their feel good 70's music like Dancing Queen, The winner Takes It All, Chiquitita, Money,Money,Money, I Have A Dream, and Mama Mia, among others. With that, conquering the Tuna Capital of the Philippines, Viva Lines Inc., Redstone Media Productions and Yvonnie J Events and Production presents ABBAmania Live in GenSan! ABBAmania is a tribute album to Swedish disco-pop band ABBA, released in 1999. It followed an ITV program of the same name and featured various British and Irish artists covering ABBA songs. Now GenSan music lovers can experience the ABBA-style showmanship - a musical experience like no other. ABBAmania have taken the wonderful music of ABBA to places such as: Denmark; England; Portugal; Scotland; Belgium; France; Ireland; Germany, and Holland. This year they geared up for the Philippines with a series of tours around the country. ABBAmania will invade GenSan on March 30, 2014 at Lagao Gym 6pm in celebration of ABBA's 40 years of magic. For tickets reservation, you may call 09279238202 and 09395599194; or visit ticket outlets at SM City - General Santos event center and Gaisano Mall of GenSan atrium. 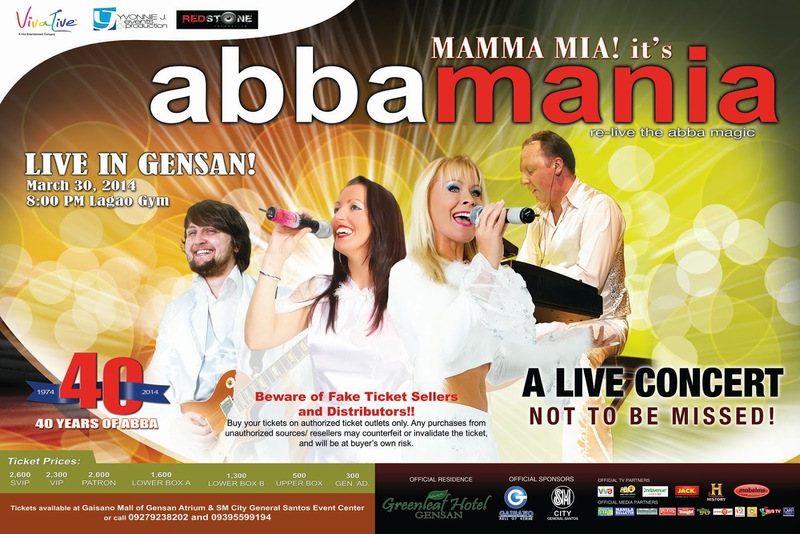 ABBAmania Live in GenSan is made possible by generous partner Greenleaf Hotel GenSan as the official residence; and official sponsors SM City - General Santos and Gaisano Mall of GenSan.